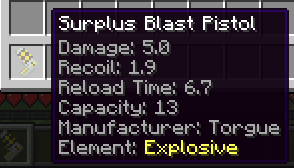 Does anyone know of any modpacks in the ATLauncher or FTB that use this mod? Is there any way to change the rate at witch the guns and shields drop. Was looking for a config file and can't find one. Thanks in advanced! 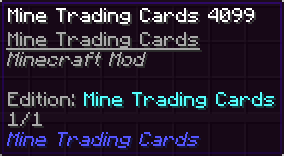 I may be adding it to my other Modpack, Cataclysm, on FTB soon. So, it's been over a year now since this mod initially went in to development. I'm absolutely humbled by how much people have supported this mod and definitely want to continue giving back through updates and additions but, as it sits, it's become quite apparent that the mess of code it has become is impeding development. This compounded with the new year, and the want to move forward to newer projects, I've decided to put this temporarily on hold. I do plan, at some point, to completely rebuild (and even open source) this, but I cannot promise an ETA. I know not everyone will be happy with this change, but it's something I've decided is for the best. In the meantime, those looking for something in a similar vein, I suggest checking out my You Will Die Mod, as it pulls from similar inspirations with it's randomly generated nature. Hello there! Welcome to the Borderlands Weapon Mod! Before we begin, a little explanation is necessary, this mod was originally intended to be a full out Borderlands mod, but after things started not working, and not working on the mod for a couple months, I pretty much gave up on it. But I finally decided, I didn't want to waste this, I'd strip the mod down and start again, and thus, here we are! I honestly don't know how often I'll update this (as I am working on other projects), but I suppose we shall see what the future brings us! 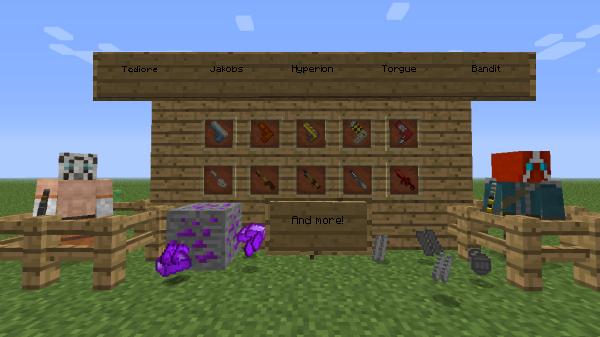 This mod currents adds a variety of items such as randomly generated pistols, shotguns, assault rifles, sniper rifles (z to zoom), rocket launchers, and smgs, randomly generated shields (which go in the chest armor slot), randomly generated grenade mods (which go in boot armor slot, g to throw grenades by default), Marauders and Psychos of varying levels, Eridium, and more from Borderlands to your singleplayer and multiplayer Minecraft experience. You can find things such as weapons and shields in the combat tab in creative, and they have a small chance to be dropped by any mob on death. There's Vladof, Jakobs, you name it, each gaining abilities as presented in the game. For example, Jakobs weapons will fire as fast as you can click, appropriate Dahl weapons will burst fire, Pangolin shields will reduce hp for increased capacity, and Maliwan weapons will always be elemental! Experiment with different gun stats, and see what works best! To use, place in leg armor slot. This mod requires Forge! Then just drag this zip into the .minecraft/mods folder. Please leave a comment if we are no longer compatible with the latest version of forge, or if there are any bugs in the mod! Like this mod? Think about donating towards the development of this and any other projects I currently work on. All my mods and projects are completely self managed, and making sure they are as good as they can be is top priority! All donations are greatly appreciated! Modpack Guidelines: You may feel free to use this mod in a modpack, provided proper credit is given (i.e. Made by xFyreStorm), and you in no way claim to own this mod. I am also not associated with Borderlands in any way, nor do I own Borderlands or anything relating to Borderlands. This is a purely fan made mod. If you like this, be sure to check out my other Minecraft-related projects! I made this post fairly quickly, so if there is anything else I'm missing, please feel free to remind me, and, as I've said, this is very much a work in progress! Title image made with Cool Text. This mod has a lot of potential, I hope to see more in the future. Psychos and marauders don't work for me :/ (no spawn eggs) unless I have to find them? Could you add stuff like leveling up and different classes to this mod? You don't have to, but just a suggestion. What happened to this? It was so good! So... I have a Mac and I love mods, but I've never downloaded one for myself. I have been trying to get your mod to work but my lack of experience makes it impossible. I downloaded Forge 1.6.4 and installed the client. I dragged your mod into the mods folder and I set everything to 1.6.4. What am I doing wrong and what do I need to do to correct my current malady? I guess nobody is gong to revive this? Probably not. I sent them a message requesting permission, but they haven't replied. It's been at least three months. Originally created by Tradeworld, I'm continuing it. Great mod-in-progress, check it out. I will. I'm getting some people together to help continue this, but not in mod form. I'm thinking I may be able to do the server un-modded too, meaning everyone can enjoy it without having to download a single mod.